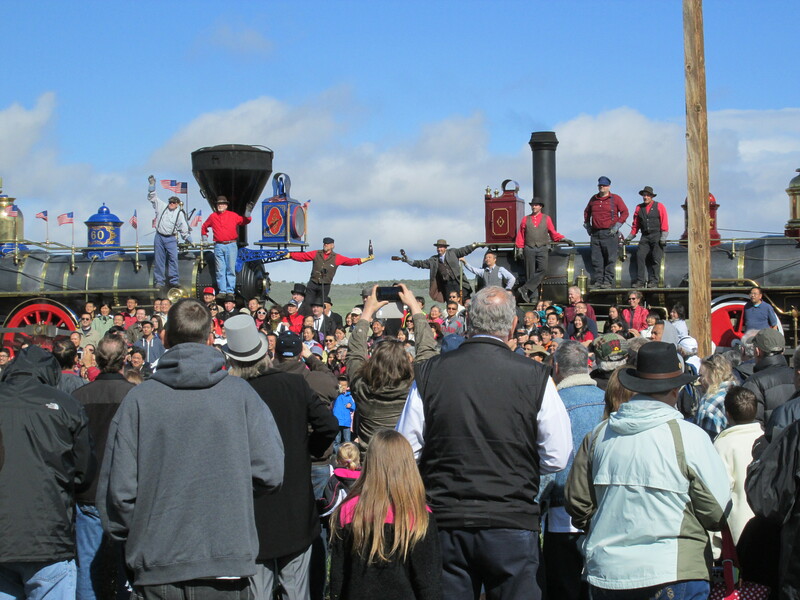 On May 10, 2014, the Golden Spike National Historic Site held a reenactment of the joining of the Union Pacific Railroad with the Central Pacific Railroad at Promontory Summit, Utah. The reenactment was held on the 145th anniversary of the driving of the golden spike, and I was there to witness it. 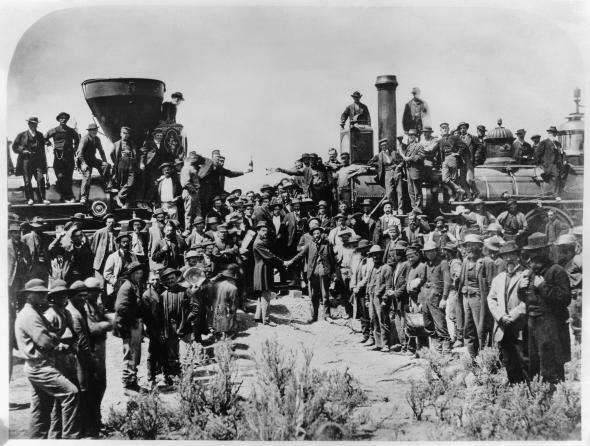 This historic event in 1869 signaled the completion of the first transcontinental railroad, joining the eastern states with the western ones in a way that forever made the United States one country. I arrived early in the morning on a blustery, cold day, to join with several hundred other folks who came to enjoy the dynamic display of the two replica locomotives and the enthusiastic performance by dozens of reenactors as we all relived the driving of the golden spike. Actually, there were four spikes. You can learn about each of them by visiting the National Park’s website: http://www.nps.gov/gosp/index.htm. The reenactors staged a recreation of a famous photograph that received wide distribution at the time. The Central Pacific’s locomotive Jupiter touched its cowcatcher with the one from the Union Pacific’s #119 and the engineers toasted each other with extended champagne bottles. The Jupiter’s diamond-shaped smoke stack identifies it as a wood-burner. The straight stack on #119 reveals it to be burning coal. 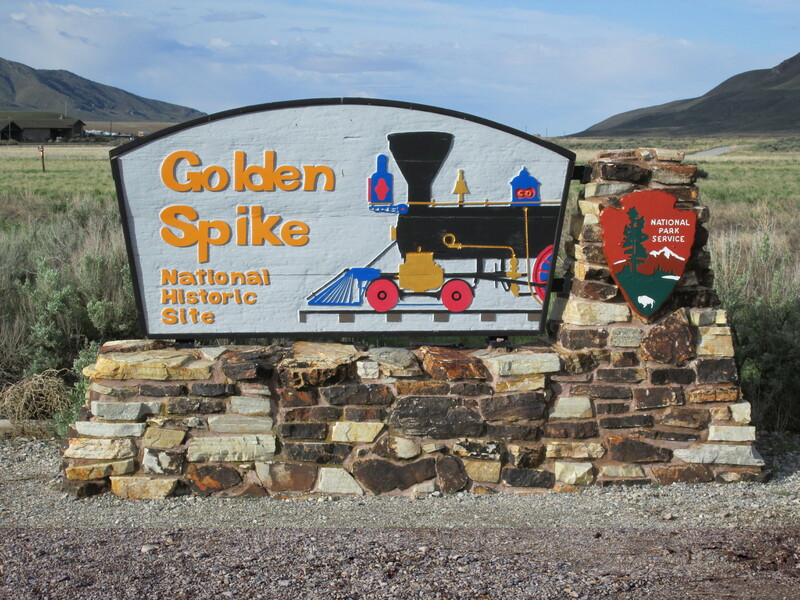 This visit provided me with much needed research information that I will be using in writing Golden Spike: The Iron Horse Chronicles–Book Three. Will Braddock and his friends will be central characters in the celebration to mark the completion of the first transcontinental railroad. But before we reach those concluding episodes, I hope you will enjoy Eagle Talons, which will be released by Five Star Publishing on October 22, 2014. This entry was posted in Central Pacific, Eagle Talons - Book One, Geography, Golden Spike - Book Three, Iron Horse Chronicles' Characters, Museums and Parks, The Iron Horse Chronicles, Transcontinental Railroad, Union Pacific and tagged Adventure Fiction, Fictional Character, First Transcontinental Railroad, Frontier Fiction, Historical Fiction, Historical Parks, Locomotives, Museums, Pioneer Life, Teen Fiction, Trains, Transcontinental Railroad Locomotives, Western Fiction, Westward Expansion (1867-1869), Young Adult Fiction, Young Readers. Bookmark the permalink.